I quick post because I have missed two weeks, and I don’t want you to forget about me and wander off to look at other blogs. First, the excuses! I missed blogging two weeks ago, because I was proof reading again. My second attempt after the first turned into a massive re-edit due to “Editor Problems”. It has now gone back for a professional proof read, after which it will be set in stone. I am now completely sick of the book. The ad from Amazon recommending it to me suffered short thrift, I’m afraid. It took several days to recover, with a bit of reading and catching up with the rest of my life. I even managed an afternoon of gardening – that put paid to last weeks post. I have been trying to catch up with some of the books on my TBR pile, which resulted in some interesting thoughts. Why do I enjoy some books and not others? Some of the books were by local fellow writers, that I “had” to read. The first was a romantic novel. The author is doing well, this is her third book and it was even on sale in Sainsburys! It had one of those covers with pastel colours and a title in swirly writing It was well written, entertaining, but I was unable to write a review. Not because there was anything wrong with it, but to write a review you need to compare a book with others of its type and I don’t tend to read this sort of book. Why? I like a bit of romance as much as the next (wo)man – I am starting to worry that too much romance is creeping into my own writing – but it has to be accompanied by some history. Not just boy meets girl, boy looses girl due to some innocent misunderstanding, boy finds girl and they live happy ever after. The sun always shines, unless a shower of rain or a blizzard is needed. Perhaps I need blood, violence and a touch of jeopardy to add spice to the mix. Another book I read recently was set during the Second World War, but on the home front. People die, but far away. It has a local setting, so it is interesting to recognise places. There is a lot of detail about the daily life of the time. Perhaps I would enjoy it more if it was set further back in history. This is that awkward period, before my time, but familiar from my parents memories. I wouldn’t normally read about this period. The First World War, possibly, but for me it has to be set at least three hundred years ago. I don’t spend all my reading life in the past. I enjoy a bit of horror, Stephen King for example, and some crime/mystery novels. A while ago we were discussing writing in the present tense and someone mentioned Elly Griffiths. I have been working through her Dr Ruth Galloway books. Is it the solving of clues to identify the murder I enjoy, or is it because the sleuth is an archaeologist? I don’t think it’s the second, but it certainly helps. I think I’d better stop there, or I’ll be here for hours – time when I could be reading something set in the Anglo-Saxon period. Or, to be honest, writing my own. 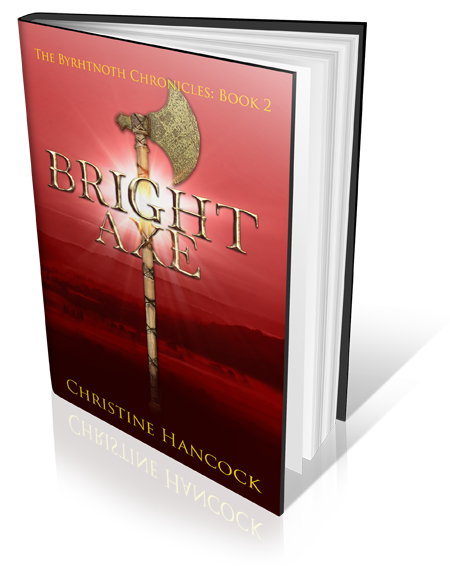 I am back editing book two, chopping out all that romance, adding a touch of blood and guts. Class started again in September. Since there are a few new students, we have begun with some basics. Already the exercises we have done has helped crystallise some new characters in book three. It (almost) helps me forget it is still four months to publication day. ← Titles, Covers and an Announcement!